At Linwood Pet Hospital, we encourage pet owners to take care of their pet’s teeth. We see pets with significant dental disease every day, and it is a preventable problem. Let us take a moment to discuss the basics of pet dental care. Caring for your pet’s teeth is extremely important for their dental care as well as their overall health. While the main goal of pet dental care is to prevent periodontal disease, poor oral hygiene can also lead to blood infections, heart disease, high blood pressure, kidney and liver problems, diabetes mellitus, bone infections, and some forms of cancer. This means that pet dental care is a crucial piece of the puzzle for your pet’s overall health throughout their lives. Periodontal disease is a widespread problem with companion animals. Both cats and dogs are at high risk for periodontal disease if they aren’t getting proper oral care. In fact, by the time your dog or cat is three years old, it is highly likely that they will have early signs of periodontal disease. It is estimated that by age three, 80 percent of dogs and 70 percent of cats have significant oral disease that will require treatment. Often, these pets will need to have teeth pulled to prevent the spread of infection and prevent those other health issues that we previously mentioned. To properly care for your pet’s teeth, you will need to keep them clean. Your biggest help in proper dental care for your pet is your veterinarian. All dogs and cats should be brought in for a dental cleaning at least once a year. 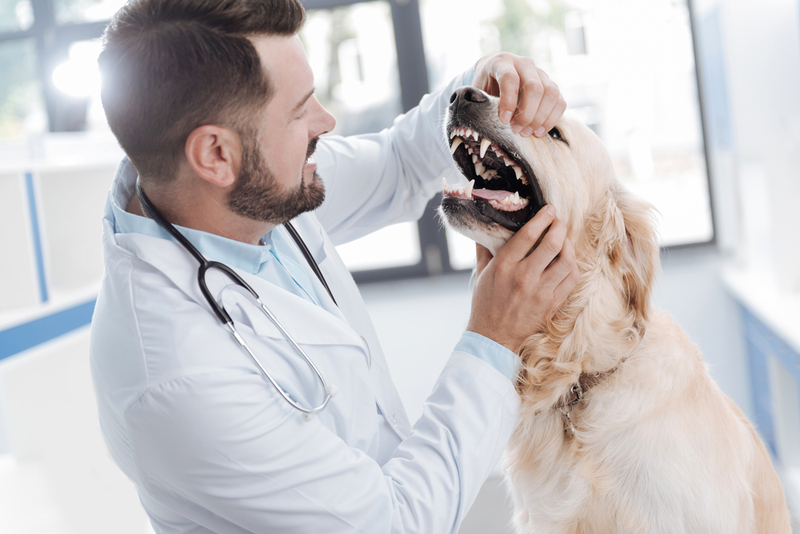 In some cases, your veterinarian may recommend that you bring your pet in for dental cleanings twice a year—especially if they are prone to oral problems. During a professional dental cleaning, while your pet is under anesthesia for their own safety and comfort, your veterinarian will inspect your pet’s teeth and gums to check for signs of dental disease as well as plaque and tartar. X-rays are also performed to make sure that there are no problems hidden below the gumline and in the bones of the jaws. The cleaning involves your veterinarian using a scaler to clean your pet’s teeth. Another key factor in your pet’s oral health is at-home care provided by you or someone in your household. You brush your teeth very frequently. It really should be the same for your pet. Since your dog or cat can’t brush their own teeth, someone in your household should be responsible for brushing your pet’s teeth at least once a day. Much like our teeth, your pet’s teeth have bacteria on them. The bacteria that can cause dental disease can recolonize on the surface of your pet’s teeth every 24 to 36 hours. While it can seem like a battle to brush your pet’s teeth daily, once your pet gets used to the process, he or she won’t mind it so much. You will need a pet-specific toothpaste and either a soft-bristled or finger toothbrush. At first, you will just want to let your pet get used to the taste of the toothpaste by putting a little on your finger and letting your pet lick it off. If your pet doesn’t seem interested in one flavor of toothpaste, there are other options you can try. When your pet is familiar with the toothpaste, you can introduce the brush by letting your pet lick the toothpaste off of it. Over the next few days, start moving the brush around in your pet’s mouth. Even if you aren’t doing much teeth brushing at first, this will get your pet used to the brush moving around the mouth. Eventually, your pet will get used to having his or her teeth brushed daily. You can give your pet a treat after each session to make the experience more enjoyable. While professional dental cleanings and daily teeth brushing are the most important things you can do to ensure the health of your pet’s teeth, there are other things you can do to help keep your pet’s teeth clean and healthy. For example, there are certain foods that your veterinarian may recommend to improve dental health. These foods are shaped in a way that mechanically cleans teeth better than other kibble options. If your veterinarian does recommend one of these foods, it is a good idea to try it out for a while. You can always discuss any concerns you have with your veterinarian at your next appointment. Next time you are at a pet store, take a look at the treat aisle. You are likely to notice a variety of products that are called dental chews. In theory, dental chews provide a similar mechanical cleaning to your pet’s teeth as a specialized dental kibble. However, when you are looking for dental chews, you will want to look for products that have the Veterinary Oral Health Council’s seal on the packaging. The seal tells you that these chews meet pre-set standards of effectiveness at removing plaque and tartar from your pet’s teeth. Avoid products like bones, cow hooves, and pig ears. These chews can damage teeth or cause stomach problems for your pet. Oral sprays can also help pet owners care for their pet’s teeth. However, these sprays are not an adequate supplement for proper brushing and regular dental cleanings. If you live near Linwood Pet Hospital, we can help care for your pet’s teeth. We offer teeth cleaning services to our patients. To schedule an appointment, give us a call at 609-926-5300.